How to find out your PMP exam eligibility? In the modern business setup, the entire functionality is divided into different project models. These are handled by skilled project managers and their teams. In such a scenario, the PMP credential is the most coveted and sought after. If you’re looking for a way to step up your career and acquire a PMP certification, it is first necessary to identify if you’re eligible for it. Individuals holding the title of Project Manager with years of relevant experience are eligible to take the PMP exam. However, what if you hold a position and you do a lot of project management even without the Project Manager title? What if you have several years of experience performing project management activities as a team member? The first thing you need to do in order to figure out if you’re eligible is to download the PMP handbook provided by the Project Management Institute. Focus on the sections that shed light on the eligibility and requirements for the PMP exam. The eligibility section speaks about the basic requirements such as educational background, project management education and project management experience. The handbook also contains sections that explain the application process in detail. Learn how work experience is counted when applying for the PMP Certification exam. Remember, it is not the title that’s important, but the project management duties that accompany your title. Project manager or not, you’re still eligible for the PMP exam, provided, you meet the guidelines mentioned in the handbook. While trying to go through the eligibility criteria, you may feel yourself lacking in some aspects. Determine whether it is possible to equip yourself with the necessary requirement to fulfil the eligibility criteria. If yes, figure out how you’re going to act upon it. For instance, PMI requires 35 contact hours as a minimum requirement to attempt the PMP test. If you do not have them, try attaining the contact hours through feasible means. EduMind’s PMP exam review courses provide the required 35 contact hours to fulfil your eligibility requirement. If you haven’t done it already, then it’s time to update your resume and list out all the recent projects you’ve been involved in. Give a detailed overview of the responsibilities that you were assigned and what your everyday tasks included. Once you’ve done that, ask yourself if you meet all the eligibility requirements from step 1. Have you worked to fill the gaps in the PMP exam requirement as mentioned in step 2? Do the roles and responsibilities listed out in your resume match a majority of the tasks from step 3? If your answer is ‘yes’ to these questions, then you most likely are eligible. If you’re still unsure and apprehensive about making a PMP application, contact PMI’s customer care to help you with any queries you may have. Send an email to customercare@pmi.org and the PMI’s helpful staff will put your worries to rest. 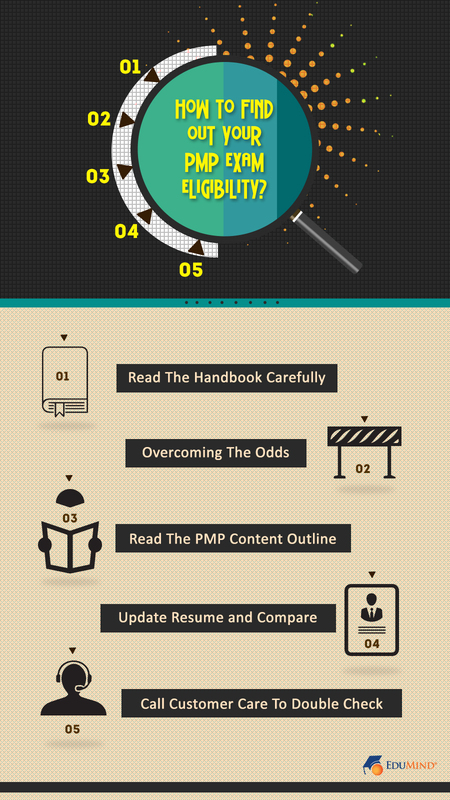 With these steps, you can determine if you’re eligible to take up the PMP exam and can proceed with the PMP application process. Before you consider appearing for a PMP Certification exam, ask yourself what you intend to gain from it. Getting a certification is not a difficult task, but it does call for timely preparation and dedication to pass with flying colors. A PMP Certification will add value to your resume if you are a professional who has experience in handling projects for small or midsize firms. It will prepare you to manage projects of large stature that require extensive planning and management skills. Your learning process does not end with passing the certification exam. It will continue with your practical experience of managing projects, imparting learning to others and consistently improving your skills as a project manager. To be eligible for the PMP exam, one must have completed at least 3 years of project management experience. If you have missed out on maintaining records of your project management achievements and routine, it’s alright. A rough estimate outlining the period and the major tasks accomplished will suffice for determining your eligibility. The PMP certification exam is based on 200 multiple choice questions. Each question will have four options with one correct answer and three incorrect answers. Students can know their results immediately upon completion of the 200 questions. The question pattern will encompass topics related to Initiating the project, planning the project, executing the project, monitoring and controlling the project and closing the project. The individual topic wise spread will vary from exam to exam on a periodical basis. Students trying to obtain PMP certification must put in enough working hours in attempting previous question papers. Free downloads of previous years question content is available online on various portals. Aspirants can set up time bound mock tests on their own and evaluate their progress to face the final exam. There are thousands of PMI chapters located in major cities across the world from where you can seek professional help for appearing for the exam. The training is provided by experienced lecturers who are certified PMP professionals. The coaching ensures that you pick up the nuances of the certification course. This will help clear the exam easily and assist in professional practice after you’ve completed the certification. PMP exams require a lot more physical and mental endurance. You must study for the exam like you are running a real-time project with a near approaching deadline. Hence, ensure that you have all the required resources within quick reach to make the best use of available time. It is ideal to start preparing early. Ensure you revise occasionally the completed portions. Split the entire portion in small parts so that it inspires optimism to achieve it. Choose the right kind of study material to supplement your learning process. There are plenty of guides and quick learning materials available in electronic and paperback. These will help you gain an upper hand on the relevant topics. A proven way to clear PMP preparation exam is to prepare yourself physically and mentally for those four hours of intensive exam. “It makes a big difference in your life when you stay positive.” ― Ellen DeGeneres, in her book "Seriously... I'm Kidding"
Most of us in this fast-paced world, try to get most of things done under the shortest duration. So there are certain tasks that can’t be multi-tasked and definitely requires our complete attention. The Project Management Professional (PMP®) Certification is also one such complete attention grabbing assignment. For some aspirants, learning comes naturally and for others it's a chore that is strenuous to carry out. But remember whatever your learning energy schema may be, PMP Certification is a accomplishment that you must aim for and acquire it. When looking at the study process and getting to know the theory of what you have understood through experience may seem difficult but not unachievable. It all depends on how you view the difficulty that you are facing in the course of your PMP® study. There was once a young woman whose mother was unwell and asked her to help with running her bakery for that day. The daughter had very little knowledge of running the bakery and had the most stressful working day. When she returned home that evening completely dejected and dishearten, the young woman wondered how her mother ran the most successful bakery in the town. Her mother had been running the bakery since her husband had passed away. She now understood what her mother was going through on every single day to run it so well. When she reached home her mother was waiting for her eagerly. Every mother is happy to encourage and cheer their off-springs and no doubt the young woman’s mother also felt so. But when her mother saw the stress lines farrowing her brow. She asked the young woman gently how her day had been. Young woman replied that she couldn’t take the stress and strain of running a bakery. She felt that she lacked the talent that her mother possessed in making the business a success. Understanding her child’s gloominess the mother suggested that they both go into the kitchen for some refresher lessons on running a successful bakery. The Mother asked her daughter to get three saucepans, a carrot, an egg and some tea leaves. She asked her daughter to pour water into the three saucepans and bring it to a boil. Then she asked her daughter to put the carrot in one, the egg in another and add tea leaves to the last one. They left the three saucepans on the stove to simmer. After sometime the mother asked her daughter what was that she saw. The daughter replied that the carrot, the egg and the tea leaves have been cooked. But her mother was not happy with her reply. ‘Why, am I not right?’ questioned the daughter. She then explained her theory in greater detail. She said that the carrot was already hard and when it faced a situational challenge it became softer, meaning cooked. Whereas the egg was fragile from the beginning but a situational challenge made it hard inside. But the tea leave stood no chance since it was neither hard nor fragile; it was simply non-consequential to the water which immediately mingled with it. The mother asked her daughter to smell the tea and asked her what she found in it. The daughter replied that she could smell the flavor of the tea and the water had changed color. The mother was happy to see that her daughter understood the hidden question that she place before her. The mother explained that the tea during a situational challenge lost its form but changed the challenging factor. The carrot and the egg did not change the water color but the tea leaves turned the water’s color thus influencing a change over the challenge. So let us not do away with the moral of the story as merely childish but simply put in plain English it means much to a Project Manager. Though the PMP® Exam may be a challenge that would be so difficult and it may eventually change you at the end. You may start out very strong and become soften by the hardship of strains of studying for the Exam and walk away. Or you might come with fear of the Exam and when faced with new challenges may get distracted from your study. Come to our PMP® class with open-mindedness. We are not saying that there is no challenge to face but we ask you to dissolve yourself in the tough track of diligent hard work and turn the stress of a PMP® Exam into a worthy accomplishment for you. Make it a point to be like the tea and change that challenge into a positive spin for your PMP® Certification goal.